Tx Scrapper Mom: I got another award!! This is my third blog award, and I must say that I feel honored each and every time. I post my stuff because I LOVE crafting, and what fun is it if you can't share it with others?! 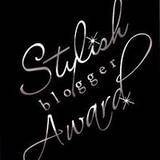 I want to thank Brandi at Scubba Scrapper for the Stylish blogger Award! Crafting is not just a hobby, it's a passion! I was born in Brazil, I've backpacked through Europe, visited many states in the U.S. and my favorite place in the world is still Disney World in Orlando! I can't wait to take my little man for the first time when he's old enough! congrats on your award and thanks that was so sweet of you!!! BTW that card with the shoe and spiderweb you did for the fccb was beautiful !!! I loved it! I voted it as my top 5 ! !